A young pig with an important job, and a new friend who changes everything. In a desolate future, one small town has survived because of a large windmill dam that acts as a fan to keep out pollution. 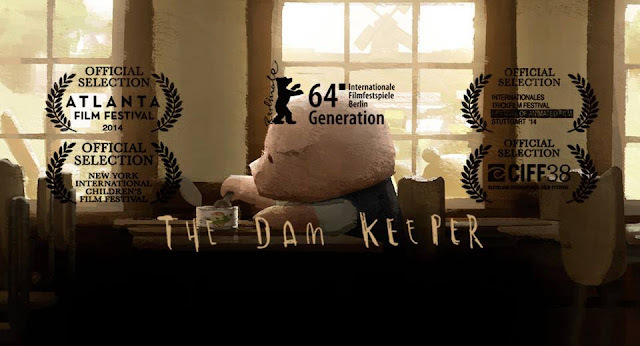 The dam's operator, the Pig, works tirelessly to keep the sails spinning and protect the town, despite abuse from classmates and an indifferent public. When a new student joins Pig's class, nothing will be the same again. The Dam Keeper is a 2014 American animated short film directed by former Pixar art directors Robert Kondo and Daisuke Tsutsumi. It tells the story of Pig, an introverted youth who lives in a windmill and keeps a dark fog from engulfing his town. Although socially rejected by his peers, he is befriended by the artistic Fox. Kondo and Tsutsumi began developing the film while working on Monsters University and produced it through a Pixar co-op program. This is Tsutsumi's second short film, after 2011's Sketchtravel, and Kondo's first directorial effort. Producers Megan Bartel and Duncan Ramsay were also employees at Pixar. The film received an Academy Award (Oscar) nomination for Best Animated Short Film. A young pig's important job is changed when a new friend changes everything.